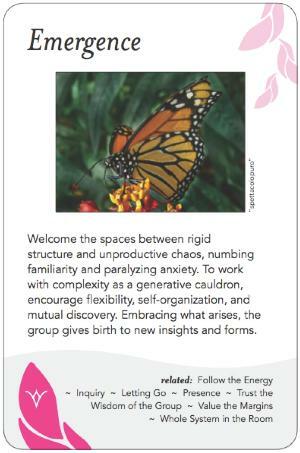 Welcome the spaces between rigid structure and unproductive chaos, numbing familiarity and paralyzing anxiety. To work with complexity as a generative cauldron, encourage flexibility, self-organization, and mutual discovery. Embracing what arises, the group gives birth to new insights and forms. Most of the issues that group process deals with are complex ones. As such, they do not lend themselves to simple solutions or even analytical, cause-and-effect techniques. An essential quality of complex situations is that the understanding of the issue or problem, and appreciation of possible approaches to that issue or problem, co-evolve. In addition, the types of interventions and 'fixes' that are possible with simpler problems just don't work in complex situations. More effective approaches in such situations are preventive, adaptive, and improvisational. By their nature, discovery and appreciation of the approaches groups will most likely want to pursue in dealing with such situations are emergent. For example, when the Transition Towns movement began looking for approaches to help communities make the transition to a post-carbon economy, there were no obvious solutions. Over time, through experimentation, global sharing of experiences, visioning, and a great deal of self-organized improvisation, some viable approaches emerged. Had the group process been fixated on outcomes, a set process, and established techniques of analysis, they would have failed. It's important to let go of pre-defined structure, trust the intelligence and instincts of the group, and balance the right structure to foster emergence with enough space to allow organic process. Too much structure and things stay linear: emergence doesn't happen. Too little structure, chaos prevents anything coherent from emerging. Too little comfort & trust, participants don't bring their Truth to the table. Too much comfort, and the group falls into old patterns and nothing new emerges. The group has to remain open to the unknown, and the unexpected, and trust that something better is going to emerge than they could have imagined or planned -- a combination of optimism, exploration and wonder. In some cases the facilitator and the group need to "trust the process" -- which may entail the group self-organizing in ways and towards ends not envisioned when the session began. The result may appear to be a generative chaos, but with appropriate skilled facilitation -- methodical (but not technique-bound), purposeful, visionary, preventive, defensive, attentive, experiential, improvisational, collaborative, holistic, appreciative, open, bottom-up, trusting, humble and efficient (but effective), all at the same time -- it's actually not chaotic at all, just a smart response to a complex problem that requires a complex approach. The facilitator's role when a more structured approach is called for is analogous to that of a symphony conductor -- the activity is planned and the outcome is high performance and high predictability. In contrast, the facilitator's role when a less structured approach is called for is analogous to that of a jazz improv organizer -- the activity is emergent and the outcome may be brilliant or awful, but is likely to be very creative (and unpredictable). Or it is analogous to that of a midwife -- assisting in an often painful and exhausting process of giving birth to something astonishingly new. There are times when emergence happens unexpectedly: You might start out with one clear agenda, and as things progress you find a different process than what was contracted is in fact where the group needs to go. Telling participants to "Trust the process" can create anxiety in some participants. Allowing understanding, viable ideas, insights and potential approaches to emerge entails great risk and uncertainty, which many find uncomfortable. Some will expect the facilitator to use a prescribed tried-and-true process, but these may not be to the challenge of a complex problem. This can present a challenge for how individuals are going to participate. This often leads to the facilitation pitfall of over-assuring participants that you'll provide direction & structure. Some groups will be able, inherently or situationally, to handle emergent approaches better than others. You need to remain enough off-balance that old patterns don't prevent new ones from emerging, without being too chaotic for the process to function. The facilitator has responsibility to honour the original contract with the group - what was this time originally intended for? Sometimes this is an honouring and then, with the group's consent, letting go.